Remember when installing storeWALL wall panels you have two choices, InstallStrips or Color Matched Screw. InstallStrips use your #6 screws. Each 4′ panel uses 1 InstallStrip. Each 8′ panel uses 2 InstallStrips. Be sure to order the proper InstallStrips: Standard Duty or Heavy Duty. If you are looking for a clean and professional look after installation be sure to use our trim to finish off the corners & edges of the wall panels. Our Box Extenders will also give you a clean look around your electrical outlets. ALL TRIM IS NOW AVAILABLE IN 4′ LENGTHS. 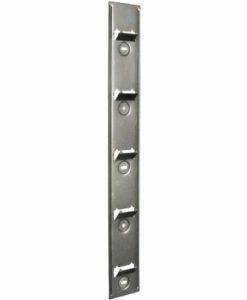 Due to an increase in oversize charges from shipping carriers, we now have StoreWALL Trim available in 4′ lengths. Saving you money and time, the 4′ Trim lengths are Ideal for those jobs where an 8′ length is just too much–reduce waste, cutting time and money! Win-Win-Win. Don’t worry, we still have the 8′ lengths for the larger wall areas.